Ticia tagged me last month with this fun series, so you get an exceptionally verbose post from me! Me and Mike, both twenty years old. I spent a summer working in a marine biology camp in L.A., where I got to go swimming with sharks! One of the other camp counselors went on to become a proper marine biologist, and I always enjoy reading about her adventures – and seeing her stunning photos! I’m the fourth of ten kids. Six girls and four boys, just under twenty years apart total. My brothers and sisters are my best friends, and an amazing support network. And my parents! I was diagnosed with cancer thirty years ago last month. It left me with a twelve-inch scar, a few bald toddler photos, and one kidney. I hope that, someday, all cancer stories will have happy endings like mine – and daydream of kinder treatments after that. My freshman year of college I got an incredible job working in a cancer research lab. I learned that tumors look every bit as hideous as they should given what they do to people. Also many other things, including that I’m not cut out for that type of work. So I respect the people doing the research all the more, and do what I can to support it. I’m currently reading and loving Parenting a Child Who Has Intense Emotions. It can be a bit of a dense read, but has lots of practical, sage advice. Next on my list is Bringing Up Bebe: One American Mother Discovers the Wisdom of French Parenting, primarily because I don’t recall finding French parenting (at least the Parisian version) so incredibly wise when I lived there as a 9-12-year-old. So, I’m coming in with a bit of bias; we’ll see if the book can sway me on that. I was a drama geek in high school. I auditioned all the time and rarely got parts. I find it mildly comforting that several of my peers have gone on to have professional stage-acting careers. I did get to compose a score for a play (think theater organ special effects score), and student direct a musical – both fantastic experiences. I started high school so incredibly shy that I would jump when people said hi to me in the halls. I had been bullied a fair bit in middle school, and will always be grateful for the kindness of my peers and teachers in high school (new school, new country, new continent). The library was my middle school haven. My English and history teachers used to let me go to the library instead of class, because I always got my homework done and learned the material (and possibly due to the bullying issue). I did go to Spanish, science, and math class, as well as band (I played flute one year and French Horn the next) and gym. I read nearly every book in that library in two years, and most of the social research articles that were kept in massive binders along one wall. I find it incredibly ironic that I didn’t put two and two together and realize that I liked social research until I got to graduate school. Once I decided not to do clinical research, I found a job working in my university’s music library, and stayed there for four years – working Saturdays once I graduated and was teaching high school. I learned how to catalog new books, and enjoyed listening to music (on headphones) while shelving books. I even got homework (and, after graduating, grading) done when it was quiet and I was at the front desk. I frequently worked more than one job at a time before having kids. Twice I was juggled five different part-time jobs – once in the summer of 2002 or 2003 and again in 2005, while pregnant with Emma. 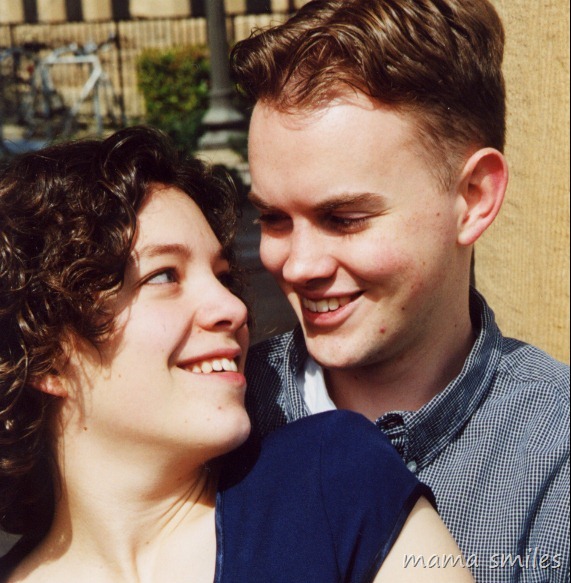 I celebrate eleven years of marriage this month (had to save that for number eleven!) Happy Anniversary, Mike! Mike and I met the first day of freshman orientation at college. We were assigned to the same dorm, and met walking over to that evening’s event. He tells a very fun, somewhat exaggerated version of the story, but – long story short – we were instant friends, neither one of us remotely looking for a romantic relationship, but that’s how it turned out! 2. What is the hardest thing about being a parent? Decisions! Whether to send them to school or homeschool, whether to enroll them in activities or give them more free time, when to wait for a child to grow out of a phase and when to intervene. 3. Are any of your children just like you? I swear at times Princess is a carbon copy and there are times Batman is really similar too. Not so far. I see pieces of both myself and Mike in all three kids, as well as traits that are their own original thing. Lily probably comes the closest so far, but in many ways she is incredibly different. I’m curious to see what our fourth will be like. I used to think Emma was nothing like me, but she is reminding me more of myself as she grows up. 4. What was your favorite subject as a kid? If you’re homeschooling or teaching, is that your favorite subject to teach? I always loved music, and wanted to do art and dance, but never had the opportunity. When I was in grad school I taught problem based learning for first year medical school students (undergraduates in the UK) – best job ever. They would get a medical case, and my job was to sit there, watch them work through it, and intervene only if they got WAY off-course. It was so much fun watching young, brilliant minds at work! 5. When you travel what is the one thing you have to have or do? I love to stop at Visitor’s Centers for different states. I love museums, and when I’ve traveled in Europe I enjoy visiting all the different churches. I found one in Vienna (Austria – lived there for all four years of high school) once that had pink and green marble columns! 6. What one food do you absolutely love? I must be hungry, because I swear I don’t think about food all the time. Chocolate, especially dark chocolate. And sugar snap peas fresh off the vine. Whatever animal is killing our sugar snap pea plants by chewing the vines at the base needs to stop. 7. What type of books do you tend to read? Parenting books, craft books, and juvenile fiction, especially historical fiction like Wool-Pack by Cynthia Harnett. I also adore picture books! Anything dark and depressing, which there was a lot of in my English classes. I don’t tolerate violence very well, either. 9. What is your favorite play by William Shakespeare? Tough question! I really loved Shakespeare as a kid. I have a soft spot for Much Ado About Nothing, although it is quite a silly play. 11. If practicality was not a problem, what kind of pet would you have? I’ve always thought a small, well-tempered dragon would be adorable. Mosquito and tick eating, ideally. I’m fine with it catching mice as well, so long as it doesn’t bring them in the house or leave them at the doorstep! If you made it clear to the end of this post, like these types of things and haven’t been tagged by someone yet, consider yourself tagged, let me know you’re answering, and I’ll be sure to read it! What do you miss least about being a kid? How do you cope with tough days? If resources (time, money, etc.) were not an issue, what is a hobby you would love to explore, and why? What is your favorite color? Has it always been your favorite? Happy anniversary to you too, Sweetie! There were so many things I wanted to comment to, and now my mind is happily spinning along forming comments for you questions……….. I love Much Ado About Nothing, that is probably my second favorite Shakespeare play, and the Kenneth Branaugh movie version is such fun! I really want to read your comments!!! This is great! Your pet idea cracked me up! :) And just the idea of juggling 5 part-time jobs makes my head spin! Guess it was good preparation for motherhood, though! Definitely! I found it easier, though to stay organized with five different jobs than to run the few errands I do with three small children! My 11 things post is up, if you want to have a peek. :) Thanks for the inspiration. I enjoyed answering your questions! I really enjoyed reading your post! So glad you wrote one! I loved this post. You are fascinating and to grow up in a home with so many people and no t.v., definitely not typical. I love movies but rarely go, I was just at redbox the other day and there wasn’t one movie that looked good. Where are all the good movies? One you might like is ‘The Village’, I liked that a whole lot. I love answering questions in a crazy way so I’m going to steal your questions! LOVE your crochet patterns – simple and cute! You. Are. FASCINATING!!! It’s exhausting reading about all you’ve done, but very interesting! So interesting, MaryAnne! Such a smart lady! And you are so beautiful and LOVE how you handled tagging!!!!! The biggest reason I dread these things – I don’t like making others feel obligated. You are a stand-out! You have done so much! Your background is very neat. That picture of you and Mike is adorable! Happy Anniversary! Do you think one of your kids might play? I feel like I know you better now! I will post one tomorrow!!! I’m glad you survived cancer…in a selfish manner…because I love you as a friend! Thank you so much, sherri! Looking forward to your post!!! Love this idea and plan to blog about it in July. Maryanne sent you a tweet too! I think I average 2-3 pages a day, Crystal – so VERY slowly! It was so fun to read more about you! I juggled 4 jobs at once one time! I’m in awe that you had 5! :) And bahahaha to a well-tempered dragon. Send me one when you find one. Great post – I learned a lot more about you :) When I was a kid I dreamed of going to space and becoming “a space doctor”. Wow! You have really done a wide variety of things. I loved getting to know you better.